I'm looking forward to the 2009 Turner Prize. Apparently the entrants include an artist who has mocked up the interior of a modern kitchen, and another who has taken video images of falling teacups. Just how far the panel can keep going in their pursuit of rewarding non-art is anyone's guess. Here in Edinburgh, its fantastic to be able to go the National Gallery and see some REAL art - a living artist who is first and foremost a painter. Just canvas, brush and paint. Hard to believe that these archaic ingredients, in the right hands, can still change the way we see the world. 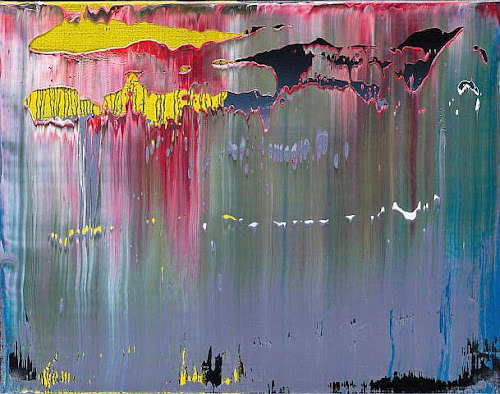 But given the artist is Gerhard Richter, it just so happens to be possible. Richter is an artist who has the stature of a Picasso, a Pollock or a Raushenberg. He is probably the most important living painter and is certainly the most famous. His current exhibition, gathered from various private collections, is at the National Gallery till Jan 4th. For a mere six quid, be prepared to walk in and get blown away by some of the greatest contemporary paintings in existence. First off, I was desperate to see 'Kerze'(1988). 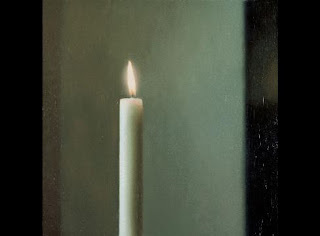 This image of a candle has been lying in my record collection since the early 1990's as the cover of Sonic Youth's 'Daydream Nation', and it is essentially a still life piece that echoes the Dutch Masters. If you are lucky enough to get up close to it, you'll get the urge to reach out your open hand and feel the warmth of the flame. The realism is eery. What is even more astounding however is that this piece sits next to a set of minimalist colour panels, a multi-paned glass canvas, and a group of huge abstract splash paintings which have an exhilirating gravitas (and owe a great deal to Mark Rothko). The range of styles, let alone the awesome virtuosity, is something you just don't see with other modern artists, in any medium. I had my 4-year old son along, and he loved the big coloured abstracts. He is a born critic, and managed to comment that 'the painter forgot to paint in those ones' when we came to a series of huge blank looking gray canvases - the complete opposite of what had gone before. These were apparently based on electron-miscroscope images of silicate, and their strange empty uniformity provides a great foil for the rest of the exhibits. Richter's greatness is that his work spans an amazing range of styles, from minimalism to abstract expressionism to capitalist realism (the school from which his talent emerged in post-war Germany). Whilst some of it doesn't feel wholly original, it all feels authentic and believable - two ingredients the Turner prize forgot about years ago.